Imagine standing at the bottom of a large mountain, your eyes fixated on the ultimate destination – the peak. Filled with optimism and determination, you begin your trek to the top, armed with a clear mental vision of your destination. You know it’s possible because you’ve seen it. Below is an excerpt from one of the most widely recognized self-help books of all time, Napoleon Hill’s Think and Grow Rich. 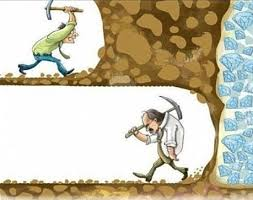 It’s a beautiful illustration of the power of persistence. An uncle of R.U. Darby was caught by the “gold fever” in the gold-rush days, and went west to “dig and grow rich.” He had never heard that more gold has been mined from the brains of men than has ever been taken from the earth. He staked a claim and went to work with pick and shovel. Down went the drills! Up went the hopes of Darby and Uncle! Then something happened! The vein of gold ore disappeared! They had come to the end of the rainbow, and the pot of gold was no longer there! They drilled on, desperately trying to pick up the vein again — all to no avail. Finally, they decided to quit. They sold the machinery to a junk man for a few hundred dollars, and took the train back home. The junk man called in a mining engineer to look at the mine and do a little calculating. The engineer advised that the project had failed because the owners were not familiar with “fault lines.” His calculations showed that the vein would be found just three feet from where the Darbys had stopped drilling. That is exactly where it was found! If God placed a dream in your heart and you are considering quitting, I encourage you to write these five words on a sticky note and put it in a visible place; a place that you will see every day. What a great visual and story about something that we all face throughout our lives.